Global Soluble Fibers Market size was estimated over USD 1.5 billion in 2016 and will exhibit growth by a CAGR of over 16% up to 2024. 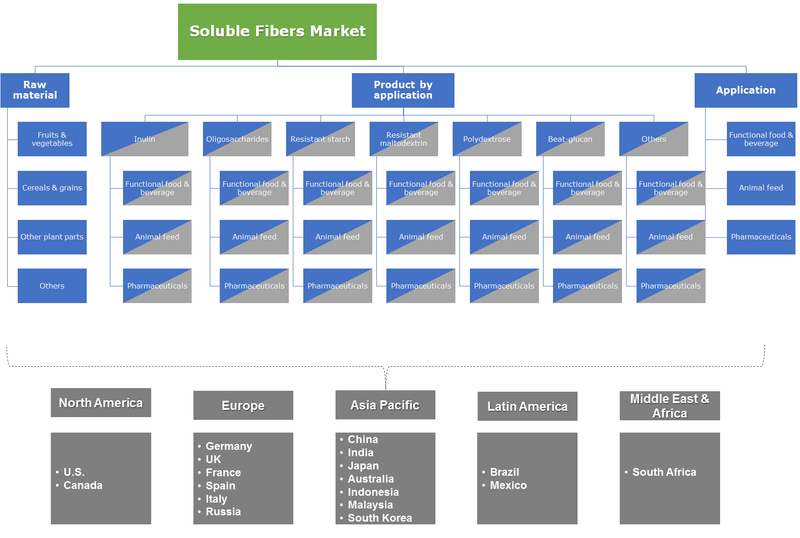 The global soluble fibers market growth will be chiefly driven by rising awareness about the product benefits in developed economies of North America and Europe. The health benefits associated with them have led to an increased consumption of soluble fibers based dietary supplements and functional food & beverages. It is a type of dietary fiber which dissolves in water and are readily fermented in the colon into physiologically active byproducts and gases. Upon attracting water from the body, soluble fibers form a gel like substance, slowing the rate of digestion and are useful in lowering cholesterol, controlling blood sugar levels, and helping in digestion. A reduced digestion rate will slow the absorption of sugar from food, preventing instant spikes in blood sugar levels and promoting weight loss. The product has the ability to bind cholesterol and bile acids for excretion rather than absorption, further lowering the body’s cholesterol level. Soluble fibers also increase the weight, size, and softness of stool, making it easier to pass and lowering risk of hemorrhoids and small pouches in your colon. Awareness about the health effects of fiber rich food consumption has been growing in the developed nations of North America and Western Europe. Typically, 20 to 35 grams of daily fiber intake is recommended for an adult person. However, studies show that an average American consumes only 12 to 17 grams daily, leading to an increased demand for food supplements that contain soluble fibers. Food & beverage manufacturers are also increasingly adding soluble fibers in their products to enhance the nutritional content and boost the fiber content. This will contribute towards the product market growth during the forecast period. Increasing instances of constipation and other digestive diseases among the global population will also help the soluble fibers market to grow. Results based on four surveys conducted in the U.S. estimated that constipation was the most common digestive problem in the country with over 4 million people having frequent problems. Moreover, over 900 people die annually due to diseases associated with or related to constipation. Prevalence rates of constipation have also been found to be high in many European and Asian countries by similar studies. These factors will increase product demand for use in functional foods and dietary supplements and will provide favorable growth opportunities for soluble fibers market to grow. The major hindrance in the growth of the soluble fibers market is the harmful effects associated with their over-consumption. High fiber intake is further claimed to lead to an excessive production of carbon dioxide, methane, and hydrogen in the human body, which in turn causes various stomach related ailments. Increased product consumption may also lead to diarrhea and reduced mineral absorption. In some cases when the body is not receiving the required amount of water, high product consumption may also lead to severe constipation. These factors may project a negative view of the product in the mind of the consumers which may lower its demand and hinder the soluble fibers market growth in the forecast period. Based on raw materials, the soluble fibers market is segmented into fruits & vegetables, cereals & grains, other plant parts such as seeds, roots, stems, leaves, etc. and non-plant sources such as milk products, marine crustaceans, etc. Cereals & grains is a key raw material segment and accounted for more than a quarter of the overall industry. They are extensively used for the extraction of polydextrose, beta-glucans and many other important product types. Other plant products segment includes soluble fibers sourced from plant leaves, barks, roots, seeds, etc. and accounted for the largest share of the overall industry in 2016. The segment will grow by more than 17% CAGR during the forecast period owing to increasing usage of Jerusalem artichoke and chicory roots for extracting the product. Based on product types, the global soluble fibers market is segmented into inulin, oligosaccharides, resistant starch, resistant maltodextrin, polydextrose, beta-glucan, and other products such as pectin, chitosan, wheat dextrin, etc. Oligosaccharides segment has been further categorized as fructo-oligosaccharides (FOS), galacto-oligosaccharides (GOS), and others such as xylo-oligosaccharides (XOS), mannan-oligosaccharides (MOS), etc. Oligosaccharides product segment accounted for around one-fourth of the overall market in 2016 and its growth will be augmented by rising GOS demand in functional foods and pharmaceuticals. Beta-glucan segment generated a revenue exceeding USD 500 million in 2016 and will witness a healthy growth rate during the forecast timeframe owing to the health benefits provided by it including decreasing the level of saturated fats in the body and decreasing the risk of heart disease. Recent studies have suggested that beta-glucans also have immunomodulatory properties. These factors will increase product demand for use in dietary supplements and functional food products in coming years. In terms of application, the industry is segmented into functional foods & beverages, animal feed, and pharmaceuticals. Functional foods & beverages will be the major application segment and will grow with a steady rate during the forecast timeframe. The segment’s growth will be augmented by rising awareness about the advantages of functional and fortified food consumption. Developed countries of North America and Europe witnessed increasing demand for functional food products as consumers are becoming aware that conventional food items lack the required amount of nutritional value. Animal feed application segment will also witness a steady growth rate during the forecast period. Soluble fibers are being increasingly added in animal feed to increase its nutritional value and promote gut health in cattle. Inulin, polydextrose, beta-glucan, and many other products are being used as animal feed additives. North America will be a major market which accounted for over a quarter of the global industry in 2016. The regional market will be chiefly augmented by a rapidly rising health conscious population in the U.S. Increasing rate of digestive problems among the U.S. population will also augment demand for soluble fibers during the forecast timeframe. Asia Pacific market will grow by a CAGR of above 17% during the forecast period. Rising income levels in the emerging economies of the country coupled with a rapidly rising urban population will increase dietary supplements and functional foods demand in the region, which will in turn contribute towards the regional market growth. The key manufacturers in the market include Tate & Lyle, DuPont Nutrition & Health, Nexira, Archer Daniels Midland Company, and INGREDION. Other manufacturers include TIC Gums, Inc., Taiyo International, Psyllium Labs LLC, Wacker Chemie AG, Roquette, Cargill, Fiberstar, Inc., Marshall Ingredients, PMV Nutrient Products Pvt Ltd., and Fenchem. Market participants invest in extensive research & development activities to enhance their product performance and rely on new product development programs to increase their portfolio and strengthen their industry positions. Soluble fibers are present in a lot of food products in the daily diet of people. However, studies have shown that most people do not get the required amount of dietary fibers from conventional food products. This has led many food & beverage manufacturers to add soluble fibers separately in their products. Pharmaceutical and dietary supplement manufacturers are also increasingly incorporating these products in their medicines and supplements. This has led to an increased product demand, mostly in the developed economies, where awareness about the product’s health benefits is higher. This factor along with the rising number of ageing population in European countries will contribute to the global soluble fibers industry growth till 2024.